Congress Signs Historic Health Care Bill – Implications for Medical Tourism in the U.S. Whether one is a democrat or a republican, liberal or conservative, signing of this health care bill is without a doubt a historic event for the U.S. with major implications for Medical Tourism in this country. Personally we think that signing of this bill shall have positive effects on the growth and development of medical tourism in this country. Our dental surgeons and dentists agreed to answer our clients’ questions pertaining to dental implants process, crowns, and dentures. Our hope is that this blog will serve as a professional, discrete environment where one can ask questions and hopefully find answers pertaining to dental treatments. The quality and craftsmanship of our dental surgeons are unrivaled even by U.S. standards. Many dentists in our partner clinics were educated and trained in the leading dental and medical schools in this country. Consequently, our surgeons follow the same standards, apply the same techniques and use the same materials that their U.S. colleagues do. Furthermore, MedVacation’s advisory team went an extra mile to identify and select dental clinics whose personnel not only have outstanding educational background but also perform their surgeries in the state-of-the-art operating suites. If you have questions that have not been addressed here already, you can leave those below or send them to info@theMedVacation.com. I was told that I will need bone graft. Can you tell me whether I will need to have bone graft before or after your dental surgeon puts in an implant? If you have enough bone to hold your implants in place, but not enough for us to be confident the implants will stay in place for years, we will add the bone graft, while we are putting your implants in. We will put an implant in and also do bone grafting at the same time. The other situation is when you don’t have enough bone to even hold your implants in place. In that case, we will do bone grafting first and a few months later put implants in. Your X-rays will tell us whether you have enough bone to hold your implants. I heard about Zirconia and E.Max porcelain crowns. Can you tell me the difference between those two? In earlier days, all crowns were made out of metal structures and ceramic material on top of these metal structures. All of us met people with poorly made crowns that showed metal or darker areas at the base of the crown. In order to overcome this problem, later dentists began to use zirconia-based restorations. Strong, white zirconia enables us to create crowns and bridges which are whiter and brighter, as well as possess more translucent natural quality. One of the problems with zirconia porcelain crowns is that the white structure can show through the porcelain. Essentially, just like metal can show through porcelain, so can zirconia. The challenge is to keep the white from showing through the ceramic. E.Max crowns or bridges are made out of solid, homogeneous piece of porcelain block. Therefore, the shade you see on the outside of the crown or bridge is the same shade that you see on the inside of the restoration. There is neither a dark metal substructure to block out nor white zirconia structure to mask. E.Max crowns and bridges possess optical properties that are quite advantageous and extremely esthetic. With proper maintenance, dental implant dentures may last you for a lifetime. Studies show that implant supported dentures can last over 20 years. Nevertheless, many factors, including oral hygiene, general health, habits such as smoking, grinding will affected the life expectancy of dental implants. Finally, the connecting structures and locking mechanisms of your dentures should be inspected by your local dentist at the time of your annual checkup and may need to be replaced after five years. I was recommended by several individuals not to have a dental bridge for my missing tooth. What are the benefits of having a dental implant? Dental implants do not rely on neighboring teeth for support. That is, they do not require reducing other teeth, as a tooth-supported bridge does. Because nearby teeth are not altered to support the implant, more of your own teeth are left intact, improving your long-term oral health. Furthermore, individual implants allow easier access between teeth, thus improving oral hygiene. Moreover, implant material is made from different types of metallic and bone-like ceramic materials that are compatible with body tissue. They also prevent future bone loss in place of missing teeth. Finally, dental implants significantly improve the appearance of your teeth and give you back your smile. Because the implant is secured within the jawbone, the replacement teeth look, feel, and function just like your own natural teeth. The overall success rate for dental implants is 96%. The highest rate of success is for implants which are placed in the front portion of the lower jaw. Here success rate can be as high as 98-100%. Success rates for the front part of the upper jaw range between 90% and 95%. The lowest success rates occur in placement of implants in the back part of the upper and lower jaw. Here the success rates can be in the 85-95% range. It is also worthwhile to note that success rate for individuals who do not smoke is higher than that for people who smoke. I am missing four molars and considering dental implants. I heard about immediate load implants. Am I a good candidate for those? Our dental surgeons will let our clients know whether she or he is a good candidate for immediate load implants. Since you need implants for molars in the upper jaw (see our answer in regards to success rates above), we will not be able to do immediate load implants. Therefore, your procedures would require two trips to Costa Rica………….. unless you can send us dental moulds three months after implants are placed (you can discuss this option with MedVacation). Even if you have to make two trips to our beautiful country, you will still be able to save money. How much does it cost to have magnetic denture implants? To your questions in regards to magnetic attachments, magnets are not typically used for implant retained dentures. There are other types of attachments that are more commonly placed. Our dental surgeons typically use O-Ring, Bars or LOCATORS attachments. 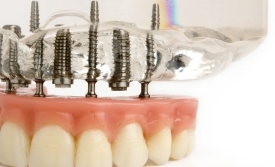 Can you tell me how many implants I will need for my dental implants dentures? If you have X-rays that you can share with us, we can determine how many implants you will need. As a rule, patients will need at least 3 implants for the upper jaw, and at least 2 implants for the lower jaw. To support upper jaw dentures, we typically put 3-4 implants. The lower jaw requires 2-3 implants to support dentures. Our dental surgeons will make their decision based on your bone condition. I need three implants and three crowns. How many days do I need to take off work for that? If we determine that you are not a good candidate for immediate load implants, you will have to visit our office twice. The first trip will require a 3 day stay, while the second will require 7 day stay. We will be able to send you crowns via mail, without you going back the second time, if you provide us with moulds three months after implants are done. This way you will save some money by not going back. Airfare to Costa Rica is typically between $400 and $500 per person. MedVacation will book hotel on your behalf for as low as $75 a night. Issues pertaining to infertility and fertility treatments are complex and certainly create a lot of questions in the minds of individuals who are either undergoing fertility treatments or seriously considering those. Since it would be impossible for us to provide answers to all the questions we receive on our website, we decided to set up a more appropriate venue for questions our clients may have. This is how this blog was born. Our fertility doctors (e.g. reproductive endocrinologists, OB/GYN doctors, embryologists, etc.) agreed to answer questions pertaining to infertility and fertility treatments. In case you are wondering about qualifications of our doctors, during the selection process of our IVF clinics, we went an extra mile to ensure our clients will receive the same high quality IVF advice and/or treatments as those available in the U.S. Our partner clinics follow the standards of the American Society for Reproductive Medicine (ASRM) and are accredited in the U.S. Our partner doctors are board certified and often hold Ph.D. on top of their M.D. degrees. We hope we can answer most of your questions and in the process help you with starting or expanding your family. Feel free to email me with your questions (Darya.Mikhailova@theMedVacation.com). I am concerned that my eggs may be of poor quality. How can one determine the quality of her eggs? We can have some basic notion about the quality of eggs by examining the size of the follicle and the level of Estradiol in the middle of the cycle. However, as the woman ages, we often deal with such factors as thickening of the external wall/skin of the egg, which in turn makes it harder for sperm to penetrate the egg. In reality, it is impossible to determine the quality of one’s eggs until we extract those from the follicles, examine them under the microscope and see the stage of their development. There are some easier methods of testing the ovarian reserve and the quality of eggs. These are chlomiphenom test, and the tests to determine the level of Follicle Stimulating Hormone (FSH) and Inhibin B. All these tests although helpful, are still not as effective as examining eggs under the microscope. Do ovarian cysts affect my chances of getting pregnant? The research shows that any ovarian cysts of 10 mm or larger reduce one’s chances of getting pregnant. For instance, studies show that women who underwent IVF treatments while they had 10 mm cyst in the beginning of the cycle were twice as unlikely to get pregnant as women who didn’t have cysts (all other factors being equal). Therefore, cysts will not prevent one from getting pregnant but will significantly reduce woman’s changes of doing so. Can I fly and how long can I be in the air, after embryo transfer? Yes, you may travel by plane. Air travel does not pose any danger to pregnancy as long as constant air pressure is maintained. Modern airplanes……….. as a rule…….. don’t have sudden air pressure changes. We received a couple of inquiries about reversing tied tubes and getting pregnant after that. Our doctors recommend IVF treatments, if you have your tubes tied and are thinking about getting pregnant. You may have heard this already from doctors in the U.S. or from research you’ve done. Getting pregnant a traditional way after reversing tied tubes may be a dangerous endeavor. First, our IVF doctors say that reversing tide tubes is typically not an effective procedure. Moreover, even if the reversing tied tubes procedure is done, chances of having tubal pregnancy (situation when the fertilize egg implants itself outside uterus) are very high for that person. That is the reason why doctors recommend to have IVF in this case. To summarize the recommended treatment course for women with tied tubes, our doctors would perform ovulation induction and egg extraction without reversing tied tubes for the patient. Several individuals asked us how many eggs are typically harvested from a donor and what happens to the unused eggs. On average, our clinics harvest 10 to 18 eggs per donor. As a rule, we fertilize all of the retrieved eggs with sperm. Certain number of fertilized eggs grow to become embryos. Our doctors transfer 1-2 embryos (more often two) in the transfer stage of the IVF process. In rare cases, in the situation of severe infertility, the doctors may recommend transferring 3 embryos. 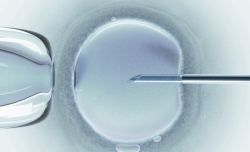 The embryos which are left after the IVF cycle can be frozen. Our clinics use the latest cryopreservation approach, which dramatically increase cryosurvival (percentage of eggs/embryos that are alive after thawing) of embryos. Traditionally, IVF clinics used the slow freezing method that has been used since the 1980’s. Our clinics use rapid freezing technique recently developed in Japan called Vitrification. With Vitrification, the temperature is lowered at 23,000 degrees C° per minute. That is 70,000 times faster than in traditional approach. Such rapid cooling coupled with cryoprotactant fluids prevents formation of ice crystals in embryos. You may be wondering why it is important to have as little ice crystal formation as possible. It is important in the embryology, because ice crystal formation is very damaging to frozen eggs and embryos. In other words, eggs do not fertilize well after thawing. The slow freezing approach produces disruption in the membrane, which causes a block to the conventional fusion and penetration of sperm with the egg surface. Our IVF clinics do all of their embryo freezing at the blastocyst stage. Upon request from our clients, our clinics can also freeze eggs rather than embryos. We freeze embryos, because statistics show that pregnancy rates are just as high in properly frozen embryos as in fresh embryos which have never been frozen. The same cannot be said for frozen eggs; pregnancy rates for frozen eggs are 15-20 lower than those for frozen embryos. Medical Tourism or Health Tourism is the term initially coined by travel agencies and mass media to describe the practice of traveling across international borders to obtain healthcare services. Today medical tourism is a rapidly growing industry that enables people residing in one country to travel to another country to receive medical, dental and surgical care of comparable quality to that available in their home countries for a fraction of the domestic cost. In addition, patients may choose to travel abroad because certain procedures are not available in their home countries, or because the wait is too long (e.g. Canadian cancer patients traveling across the border to the U.S.). Contrary to popular belief, the concept of medical tourism is not a novel one. The first recorded instance of medical tourism dates back thousands of years to when Greek pilgrims traveled from all over the Mediterranean to the small territory in the Saronic Gulf called Epidauria. Also, Americans have been engaged in medical tourism, although they may not have called it that way. For decades, many Americans have traveled to such acclaimed medical institutions as the Mayo Clinic in Minnesota, MD Anderson Hospital in Texas, Memorial Sloan-Kettering Cancer Center in New York, and John Hopkins Hospital in Maryland. Until recently, on the international scale, patient flow was mainly from less developed countries to developed countries. And not surprisingly, medical tourism to developed countries was a prerogative of the rich and the elite in the developing world. Recently, however, the skyrocketing costs of healthcare and long wait times for certain procedures, combined with the growing ease and affordability of international travel and tremendous improvements in both technology and standards of medical care in many countries began to change the face of medical tourism. In fact, the mechanism behind the growth of medical tourism was explained by Adam Smith in his monumental work The Wealth of Nations in 1776. According to Adam Smith, a country will “specialize in the manufacture and export of products [services] that can be produced most efficiently in that country.” Essentially, when we talk about medical tourism we are simply talking about outsourcing in the healthcare sector. Increasingly unsustainable health care costs in the U.S. It is estimated that in 2007 total spending on healthcare reached 2.4 trillion dollars. Nearly 46 million Americans, or 18% of the population under the age of 65, were without health insurance in 2007. This is a 4.9% increase from 2006. Moreover, some studies indicate that as many as 29% of people who had health insurance were “underinsured” with coverage so meager they were often forced to postpone medical care because of costs. In addition, as many as 120 million Americans lack dental coverage. Other sources purport that this number may be as high as 120 million. Safety and quality is our first priority! We are almost certain that you have a burning question whether treatments in developing countries such as Mexico, Costa Rica, and Columbia are safe. So that you don’t lose your interest, here is a statistic from World Health Organization. In response to US providers who may tell you that all care in other countries is dangerous, we encourage you to ask them why the World Health Organization ranks the US healthcare system at number 37 globally, after Costa Rica, Columbia, and Chile? It’s possible to get excellent care overseas, provided patients do their homework or allow MedVacation to do that for them.